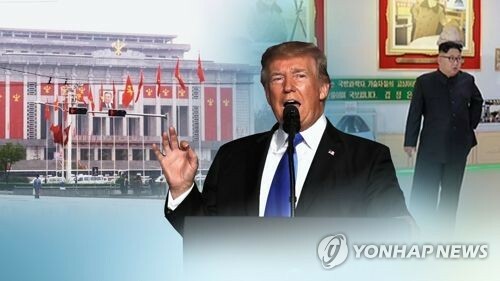 WASHINGTON, Aug. 24 (Yonhap) — More than half of Americans disapprove of U.S. President Donald Trump’s approach to relations with North Korea, a survey showed Thursday. The survey commissioned by George Washington University found that 53 percent of Americans disagreed with Trump’s way of handling the recalcitrant regime, while 43 percent approved. Early this month, Trump threatened to unleash “fire and fury” on North Korea if it continued to threaten the U.S. or it allies. The regime in Pyongyang responded with threats to fire ballistic missiles toward the U.S. territory of Guam. The poll, which had a margin of error of 3.1 percentage points, surveyed 1,009 registered voters nationwide from Aug. 13 to 17. In that period, tensions were high and then eased after North Korean leader Kim Jong-un backed down from his threats. Many voters expressed concern about Trump’s public discourse and behavior. A large majority, 71 percent, said his “behavior is not what I expect from a president,” against 27 percent who disagreed with that statement. Moreover, 68 percent agreed his “words and actions could get us accidentally involved in an international conflict,” while 29 percent disagreed. Still, 50 percent approved of Trump’s handling of the economy, while 46 percent disapproved. “The (survey) data show that more Americans object to President Trump’s character than his agenda,” Michael Cornfield, associate professor of political management at the university, said in a news release. “If there is anything approaching a consensus in today’s sharply divided America, it’s that Trump speaks and behaves inappropriately given the office he holds,” he said.